If you do not promote your blog then how will people know about your content. Blog promotion is important for bringing traffic to the blog. In today's episode, we will know 7 Ways to Increase Blog Traffic from Twitter. Twitter has a very big user base and millions of users remain active on this platform. If you use Twitter to create the right strategy for your blog, then it can be very important to increase traffic on the blog. There are many bloggers who are using Twitter to get the targeted audience to get traffic on their blogs so you should also understand the importance of Twitter for your blog and start using it. If you work smartly, you can make your Twitter profile a traffic generating key. To get traffic from Twitter to your blog, it's important to have followers on your Twitter handle first. To maximize your followers on Twitter, try the way you find people related to the niche of your blog. If your blog is of fashion category then your followers should be interested in fashion. This will give your blog a lot of benefits. If your followers are going to want content on your blog then it will be a great benefit to you and these people will visit your blog and spend time. When a great fan on your Twitter account is the follow-up, it is certain that whenever you share a link to your blog post on Twitter, a lot of them will visit your blog. Follow competitors on Twitter or those who are at the top position with your blog niche. If your blog is related to Blogging and SEO then follow people like Harsh Agarwal, who is at the top of this field, follow them. Also, follow the users who come to your blog niche and tweet your competitors / same field's blog post. With this, they will start to know about you and your blog/website and if they like your posts then they also tweet your blog post. This is a good strategy that every blogger should follow Twitter to increase traffic on the blog, and this method is quite popular and helpful. Pro TipIf you follow new bloggers instead of following old bloggers on Twitter, then it can be a plus point for you. This will increase the followers on your Twitter because when you follow the new bloggers they will be happy and in return, you will also be following. 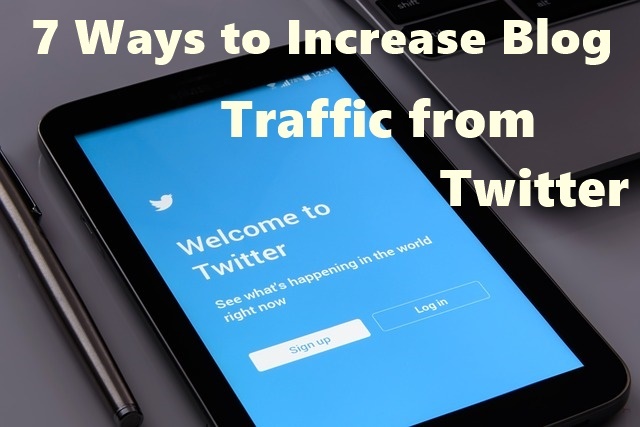 This is a great tip for Twitter to increase traffic on blogs. If you want to get traffic on a particular blog post then pin that post to your Twitter account. Whenever a visitor visits your Twitter account, it will first look pinned tweet. You can keep a link to your recent blog post or any other popular blog post as a pinned tweet. If you are active on Twitter and there are quite a few followers on your twitter handle, then this method will definitely send traffic to your blog via twitter. You can add Bio to your Twitter account attractive and add something about your blog in it. There is also an option to link the website to Twitter. Therefore, you must link your blog or website URL to a Twitter account as well. The advantage of this is that whenever a user visits the twitter profile, it is likely that they also visit your blog. This method is quite popular nowadays and Famous bloggers like Brian Dean are also using it. By using the pin to tweet in the blog post, we give our users the opportunity to tweet the content directly from the post. If you are a WordPress user then you can use click to tweet plugin and if you are not on WordPress then you can use that post by visiting the ClickToTweet website and generating a custom link for the favorite part of your blog post. A lot of people go to search in the search box on Twitter, so when you share your blog post on Twitter, use the appropriate hashtags. You must use the main keyword of your blog post as a Hashtag. Become an Active on Your Twitter Account Use of Twitter is not just to increase traffic on the blog, that is, to post links to blog posts. Understand the value of Followers and do some interesting and creative work for them. If you have mentioned about a blogger in your blog post, you can also tag it while sharing the link on Twitter, but keep in mind that you are not scamming. Hope you guys liked this post, in which we have learned about the 7 Ways to Increase Blog Traffic from Twitter. Now you might have understood that not using Twitter to post a link to the post. If you work creatively, then it can increase the traffic of your blog to a great extent. We can also call it the power of social media. If you have any other tips to increase Twitter traffic on the blog besides this, then definitely tell.